For almost 50 years following Burma’s independence, the string of 800 islands that make up the Mergui Archipelago were off limits to the outside world, frozen in time in the Andaman Sea. The islands were handed back to the indigenous Moken, a people of sea gypsies who have lived a semi-nomadic sea dwelling lifestyle there for centuries, surviving off the land and bartering fish and sea cucumbers. Sailing in Myanmar reveals a sequin trail of pure white sand beaches sloping to clear turquoise water and coral reefs. The landscape here is characterised by jungle-clad hills, lagoons, rivers and mangroves. Wildlife thrives, with gibbons, civet cats, monitor lizards, pythons and deer inhabiting the forests alongside a plethora of birds including hornbills, kingfishers, emerald doves and sea eagles. Burma (also known as Myanmar) is edged with a tropical coast that gives way to a myriad of beautiful islands. From the interesting port town of Kawthaung on the Thai border, where visitors can explore temples and markets, to the cerulean Andaman Sea, this coastline boasts an irresistible combination of natural appeal and rich culture. 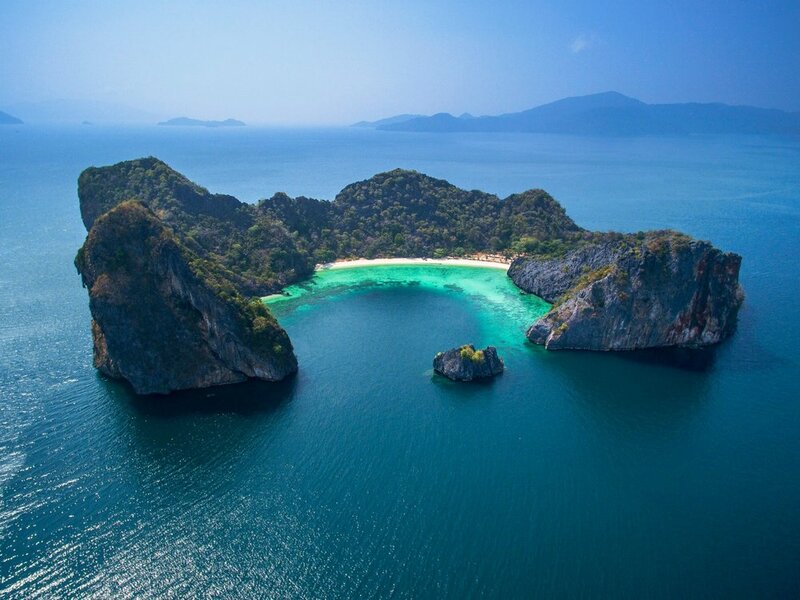 Whether you’re attracted to the paradisiac Mergui Islands, Thailand’s untrodden shores or the sparsely visited Andaman Islands, these South East Asian gems are ripe for exploration, and best visited by private yacht. A forgotten wilderness cast off the coast of Burma, the Mergui archipelago is sometimes dubbed “the lost world” and not without reason. Largely inaccessible without a boat, this string of 800 mostly uninhabited tropical islands in boasts natural wonders, endemic wildlife and interesting culture alike. The distinctive landscape is characterised by jungle-clad hills, lagoons, rivers and mangroves, and the local Moken people carve a nomadic lifestyle here. Wildlife roams the forests and birds thrive in this remote Eden. The Andaman Islands are made up of over 550 isles, islets and rocks, situated in the southeastern part of the Bay of Bengal, approximately 800 km northwest of Phuket. These islands remain isolated and only 26 are actually uninhabited. Some are strictly out-of-bounds, where indigenous tribes are among the last to remain untouched by the modern world. Notable for deserted beaches, crystal clear waters, inland forests, and India’s only active volcano, the Andaman Islands are also a scuba diver’s paradise. From the bustling shores of Phuket, where coconut plantations meet glitzy marinas, to a treasure chest of jewel-like islands dotted across the Andaman Sea, Southern Thailand provides a tropical getaway that is worthy of its popularity. These isles include the Similan Islands, the Surin Islands and the southerly isles of Koh Racha, Koh Rok and Koh Muk, blending low-key beach culture with hidden coves. Far from the busy coastline, Thailand’s southern islands’ underwater geography attracts all manner of marine life. The Mergui archipelago is best visited between November and April, when our handpicked private charter yachts spend the winter months cruising with favourable weather, winds and currents. Ultimate Yachts can take care of all internal arrangements, so all that’s left for you to do is relax and look forward to your private yacht charter. There are several airports to choose from when travelling to the Mergui archipelago. Shorter Mergui itineraries begin and end at Kawthaung, while a longer itinerary may begin or end in Phuket. Kawthaung is connected to a number of domestic airports in Burma, alternatively guests can fly into Ranong just across the Thai border. From Phuket in Thailand, we can also arrange 4-hour transfers to Kawthaung. Wherever you fly into, Ultimate Burma Yachts is well equipped to assist with transfers and immigration procedures.